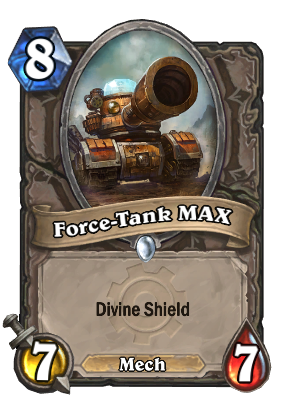 Do you guys think that the Force-Tank MAX will make a (Wild) comeback? The golden version is so sick! It's one of the few actually 'animated' cards. Quite effective in some encounters of the adventure mode that require heavy minions. A poor man's Ragnaros. Amazing in Arena. Look at Boulderfist Ogre. You're paying 2 more mana for +1 Attack and a DS. That's a reasonable mana cost for a common card with those attributes. Should BO have it's rarity adjusted? Or compare it to Stormwind Champion. You get +1/+1 and the DS for 1 more mana BUT Stormwind Champion gives +1/+1 to all your minions. If you drop SC as your 7th minion, that +1/+1 becomes insanely overpowered for a 7 drop because not only are you getting the 6/6 from the SC itself, but an additional 6/6 in buffs for your other minions but you wouldn't call for that card to have it's rarity adjusted, right? Also look at the 8 drop legendaries. Nobody is going use this card if they have an 8 drop legendary they can use instead because the 8 drop legendaries typically have better magical effects attached to them than DS. Even bumping this card up one step from common to rare would make it not worth even having. It would only be good for making dust at that level. I doubt many people are going to dust this card as is because for only 5 dust as a common it's going to be hard to find a replacement for it. waht the hell is this card lore? I believe this guy will see some play in constructed. Awesome synergy with other mechs and can be turned into a bigger Sunwalker with just one spare part. It's too expensive. For 8-10 mana, it has to do something the turn it comes into play. When divine shield is lost...recombobulate. Seeing as it guarantees you either a legendary or a refreshed D.S. I'd say that's a pretty solid value! Cool animation on the golden. 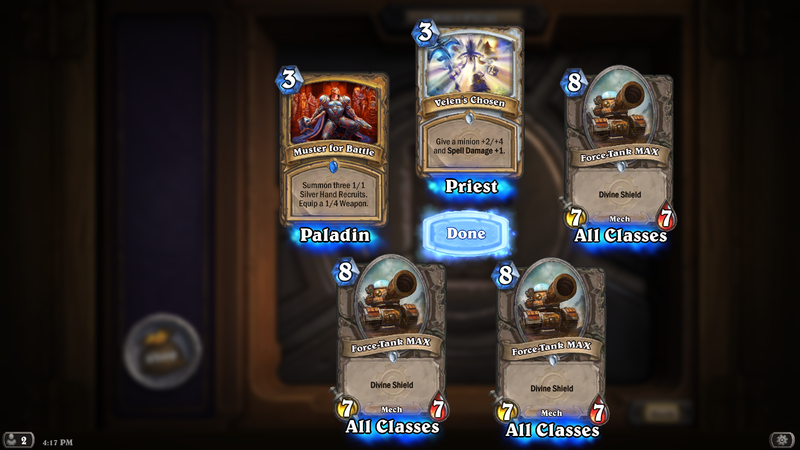 Hey that looks like a pally legendary! I think it's actually quite a solid pick, especially if it dodges a bgh. Really good in Arena. Duplicate + this card seems like a force to be reckoned with. Also faceless good stuff.